Marketing Automation featured in our SALESmanago suite is based on automation rules. Using these rules you can automatically react to behaviours or profile changes identified for contacts recorded in your database. The rules enable you to execute simple actions, such as automated notifications and alerts regarding your prospects’ activity to be sent directly to your sales team. 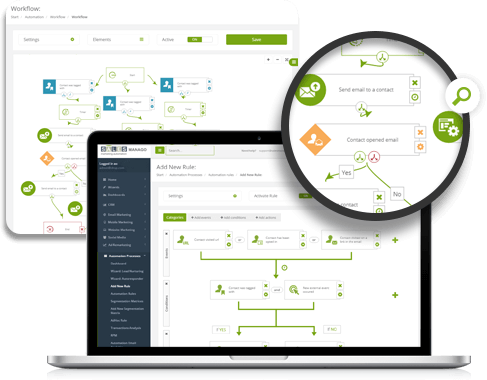 On the other hand, you can run fully automated, complex and advanced marketing campaigns thanks to workflows. Events – which is what you wish to react to automatically. SALESmanago offers you a full range of events, including: visit to your website, your email message being clicked on, adding a prospect to your marketing campaign, prospect’s scoring reaching a predefined value. Conditions – which allow you to specify precisely the contacts for which the system should perform actions and the ones that require no response. One of the basic conditions is that a contact’s scoring has reached a predefined value or that the contact has been added to a particular marketing campaign. Actions – which is where you specify what the system should do. Available actions include initiation of communication via the best-suited marketing channel, notification sent to the sales department or Call Center, transfer of a given contact within a company, moving the prospect between stages of the sales process or updating the contact’s card. You can also set Alternative Rules, which are automatically triggered when some conditions are not fulfilled. SALESmanago allows you to set up any number of automation rules and create comprehensive automated marketing processes leading your prospects from the moment of acquisition to the point of purchase. A workflow is series of automated actions that you can trigger to occur based on a person’s behaviors or contact information. With workflows, you can plan and build a comprehensive marketing campaigns including the most advanced processes. Just as in the case of simple automation rules an intuitive wizard allows to create and visualize automation processes consist of 3 elements: events, conditions and actions. By automating sales and marketing processes, companies save time they would have to spend performing these operations manually. Marketing teams who have chosen to take advantage of marketing automation can focus on key strategic processes. Using Marketing Automation the marketing team and the marketers’ involvement start generating a permanent value in the company. All activities are executed as processes permanently recorded in the SALESmanago system. This is how your company accumulates marketing knowledge and experience in the form of processes and data. Thanks to integration or the use of a CRM embedded in the system you can also start consolidating relevant sales knowledge. The company builds up a knowledge base containing valuable information regarding what works best and what does not work in sales and marketing, what optimum sales and marketing processes should look like and what prospective customers expect from these processes. The knowledge built in this way is becoming a long-lasting, important and extremely valuable capital for every company.